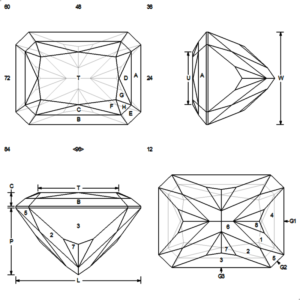 Radiant Rectangle faceting design using an OMNI-type preform. This is an intermediate to advanced level faceting design, so you’ll want very solid basic skills before tackling it. If you do have strong basic skills, while cutting this design you’ll learn about OMNI architecture, sequencing strategies, using temporary guide facets, and much more. This design was created on request for Demantoid Garnet for my long-time friend and Faceting Academy Graduate Mark Stephan – for whom it was named: “Mark’s Mastery”. The “mastery” part of the name is meant to suggest the mastery skills you’ll build while cutting it. Check out this video of Mark’s Mastery featured in a ring by Laurie Sarah jewelers! 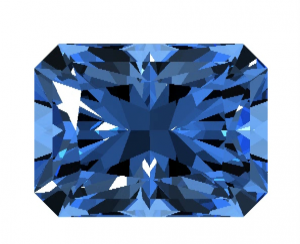 PDF and GEM files are available to Academy members – along with a detailed set of instructions in PDF – and a 20-minute video detailing every step of the cutting process.